Everything Is Forever is the latest documentary by Vic Zimet, who previously co-directed the phenomenal doc hit Random Lunacy: Videos From the Road Less Traveled. 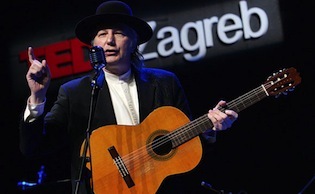 This latest documentary profiles musician Nenad Bach, who left an enormously successful career in his home country of Croatia to try to make it big in the U.S. Over the course of Bach’s professional life he has performed with a wide range of fellow musicians, from Bono to Pavarotti, and has served as an unofficial “peace” ambassador, hobnobbing with heads of state such as President Bill Clinton. Zimet has followed Bach for this documentary over the course of fifteen years all across the planet as the musician brings his songs of peace to the citizens of the world.